William Dennis Andrews was born November 23, 1945, in Breckenridge to Delton Andrews and Bonnie Cartledge. Bill served his country in the United States Army until he was honorably discharged. Following his discharge, Bill drove a truck in the oil field. He was preceded in death by his wife, Fran, and infant son, Jeremy. 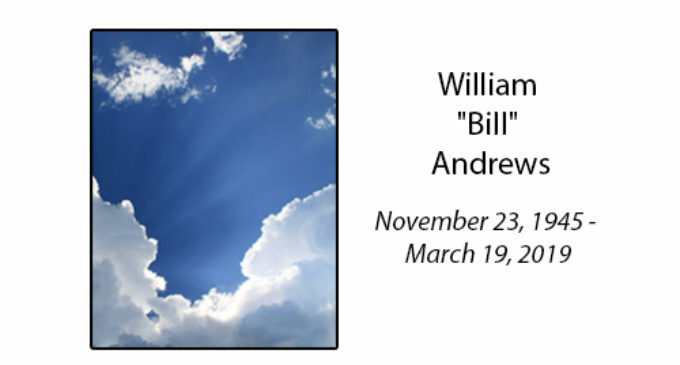 Bill is survived by his mother, Bonnie Cartledge of Breckenridge; one brother, Gary Andrews and wife Teresa; one son, Jason Andrews and wife Mei; and, one grandson, Blake Andrews.